REPORT SUMMARY: Gentrification is a powerful force for economic change in our cities, but it is often accompanied by extreme and unnecessary cultural displacement. While gentrification increases the value of properties in areas that suffered from prolonged disinvestment, it also results in rising rents, home and property values. As these rising costs reduce the supply of affordable housing, existing residents, who are often black or Hispanic, are displaced. This prevents them from benefiting from the economic growth and greater availability of services that come with increased investment. Gentrification presents a challenge to communities that are trying to achieve economic revitalization without the disruption that comes with displacement. A major transformation is occurring in the most prosperous American cities. Many of the 600+ member organizations of the NCRC have raised concerns about gentrification, displacement and transformations in their communities. We wanted to better understand where gentrification and displacement was occurring, and how to measure and monitor it. Does gentrification also mean displacement? Measuring gentrification and displacement is fraught with controversy, since people who are impacted by the economic and social transition of their neighborhoods feel the disruption of community ties directly. This study measured gentrification and displacement using empirical methods and data, which has its own flaws and limitations. First, while the use of U.S. census data improves the validity of the study’s findings, it also restricts the population analysis to a time period extending from 2000 to 2010, while the social and economic data were gathered under the U.S. Census American Community Survey (ACS) program, covering the period starting in 2000 and until 2009-2013, a five-year consolidation of the social and economic data. This limits our findings to the not-too-distant past. However, neighborhoods with a more recent dynamic of gentrification and displacement could not be covered. Second, the use of census tracts, which average about 4,000 residents, as a proxy for neighborhoods could disguise neighborhood changes taking place at smaller community sizes. As a consequence of these restrictions on the time frame and scale of the study, it should not be implied that other neighborhoods have not experienced the same effects before, during or since the study period. Instead, the study is designed to identify instances of gentrification and displacement that can be measured with a high level of confidence, and avoid falsely noting gentrification where none occurred, but it cannot capture the full-lived reality of residents in gentrifying neighborhoods. Disinvestment in low- and moderate-income communities results from a long history of discrimination in lending, housing and the exclusionary, racialized practice known as redlining. A recent study by the Federal Reserve Bank of Chicago directly linked community disinvestment with historical redlining practices evident in the Home Owners Loan Corporation (HOLC) residential security (“redlining”) maps, completed for all major cities of the U.S. 80 years ago. A 2018 study by NCRC found that three out of four neighborhoods marked “hazardous” by HOLC surveyors in the 1930s are still struggling economically, with lower incomes and higher proportions of minority residents. The economic outcomes for black and Hispanic families residing in disinvested areas are often stunted by lower incomes, fewer businesses and fewer opportunities to build wealth. This history set the stage for gentrification and displacement. Local advocates and officials should pursue policies that encourage investment while promoting the ability of existing residents to stay and benefit from revitalization. In our 2016 paper, The Community Reinvestment Act: How CRA can promote integration and prevent displacement in gentrifying neighborhoods, we identified several ways in which local stakeholders can promote revitalization to benefit the broader community, such as partnerships between banks and community-based organizations to encourage equitable development; limited-equity co-ops and community land trusts; providing existing tenants with the right of first refusal in apartment conversions coupled with low-income and first-time buyer financing programs; inclusionary zoning regulations; and split tax rates for the incumbent residents of gentrifying neighborhoods. Additionally, HUD’s Affirmatively Furthering Fair Housing (AFFH) process provides an opportunity for community groups to engage with municipal leadership in the planning process. AFFH provides a mechanism for identifying areas that are vulnerable to, or may be in the early stages of, gentrification. Community groups can then work to develop strategies to avoid displacement of incumbent residents by attracting investment and providing affordable housing. Large and small local banks can also play a role by supporting the development of housing and finance options that accommodate the retention of low- and moderate-income families in the community, rather than excluding them. Bank regulators should recognize pro-integrative bank finance as responsive to the needs of the community, crediting banks for these efforts in their CRA exams. Strategies like those advanced through HUD’s AFFH rule, promoting investment in inclusive and diverse neighborhoods, should be eligible for CRA consideration. It is essential that programs promoting the economic prosperity of incumbent residents of gentrifying neighborhoods be discussed on the public evaluations released subsequent to a CRA exam to document their effectiveness and encourage other banks to apply comparable investment strategies in their markets. 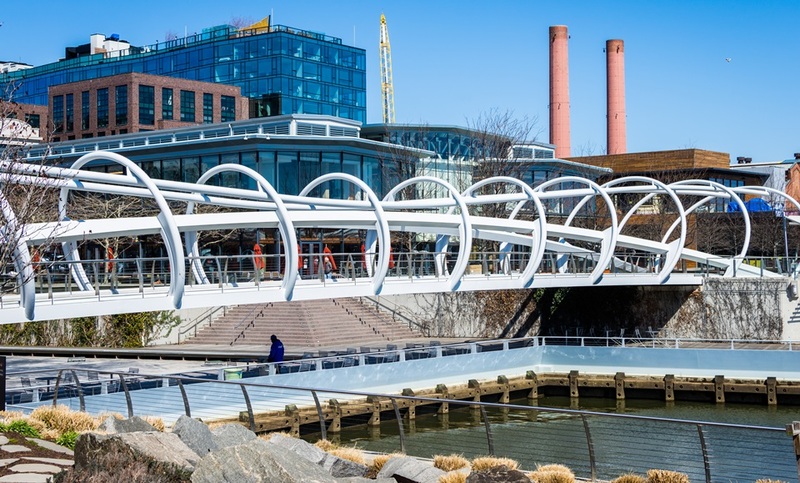 Photo of revitalized and gentrified Washington, DC waterfront via Adobe Stock. See full report on the NCRC website.